A Goat of a Different Color and Fleece Too! Learn how to Prepare & Spin Pygora Fiber! This Pygora fiber was a type B/C fiber and hand plucked from the goat. At Hawks Mountain Ranch, we have a very colorful Pygora goat herd. From snow white, Chocolate brown, black, salt and pepper grey, silver-blue to all shades of creamy caramel. Not only do our Pygora goats come in a rainbow of colors, but we also have Pygora goats in different fleece types to meet your needs too! The Pygora goat fleece can be sheared, plucked, or combed. 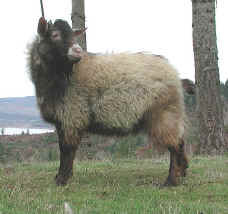 If left on the Pygora goat, most Type-B and Type-C fleeces will shed in the Spring. It is recommended that Type-A fleeces be sheared 2 times a year as most will not shed. Most type-A fleeces need to be sheared as they usually will not shed. They can be sheared twice a year. Lusterous with curls mostly at the tip. Has both characteristics of Type-A and Type-C blended together. 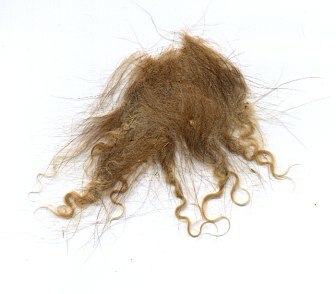 This Type-B fleece was sheared from the goat. 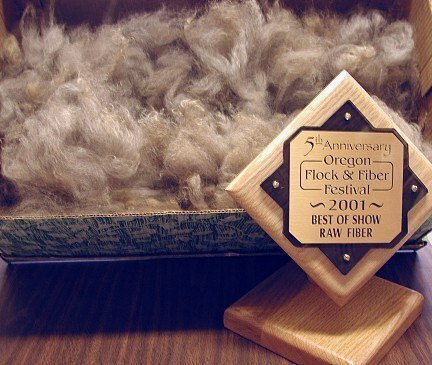 By plucking or combing this fleece, you can avoid most of the guard hairs. This is of prime value to the handspinner. This Type-C fleece has been sheared. Notice the distinct and thick guard hairs. The downy soft undercoat is so ultra fine, it is hard to see under the guard hairs in this photo. I like to pluck the Type-C downy undercoat from the goat instead of shearing as you can bypass most of the guard hairs and end up with a very valuable fiber! 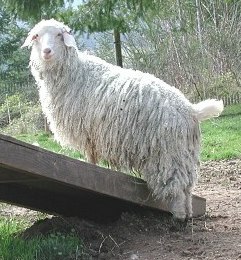 The Angora goat was bred for many years to produce fine lustrous fiber for carpeting and rugs. When spun worsted with a hard twist, it would survive years of harsh wear and come up shining. Type "A" Pygora is comparable to angora goat fiber. The plus of the Pygora is that it can maintain that soft curl even as the goat ages. Depending on how you prepare and spin it, it can be used for rugs or baby clothing. This type of fiber is best suited to a worsted, thin yarn. This fiber is as strong as type "A" but has less shine and is shorter. Guard hairs are also present. 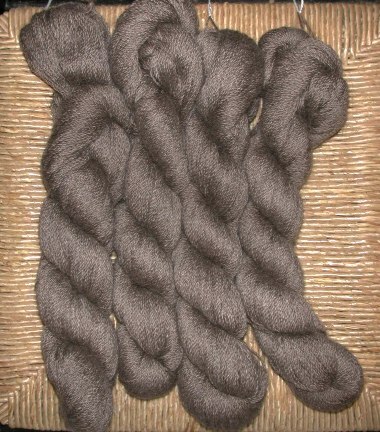 If it is spun worsted with a high amount of twist, you can produce a yarn with a lot of shine. If spun with less twist and woolen, it will make a very soft, warm yarn. It adapts itself better to a thicker yarn than type "A". Guard hairs can be removed by de-hairing with mini-combs or less effectively, by running skeins through your hands. Fulling can also be used to remove these hairs. Type "B" is the most versatile of all Pygora fibers. This fiber can be as soft as fine cashmere. This fiber has no shine. When spinning using the woolen method, no preparation is needed if the fiber was plucked or brushed off the goat. 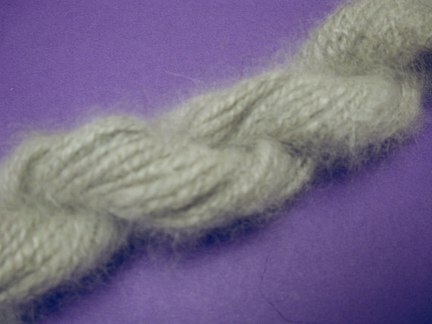 It can be spun thick or thin to make a beautiful yarn that is light and fluffy. The ratio of warmth to weight is much greater than sheep wool, so garments should be knitted using an open or lacy pattern. "Fulling" this yarn will lock in the fluff and help remove any stray guard hairs. Mini-combs are very easy to use and prepare fiber that will create a wonderful yarn. If used correctly, they will not damage even the finest fibers. 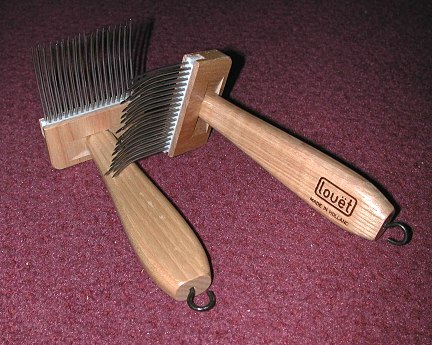 Start by filling one comb with fiber, this is called lashing the comb or charging the comb. Always keep the fiber facing the same direction. Put the shorn end of the fiber away from you, this leaves the soft tips facing you. By charging the comb this way, most of the guard hairs are behind or towards the tines of the comb. Fill the comb about half-way with fiber. As with anything in spinning, to get a quality product, take your time. If you put too much fiber on the comb, you will find it harder to work and may end up breaking and tearing it as too much fiber tends to tangle on itself. If you are using plucked fiber and it is all facing different directions, charge the comb by passing the fiber from your hand on to the comb. During the combing process the fibers will all end up facing the same direction. Start combing by passing the empty comb through the tips of the fiber on the full comb. Keep the combs at right angles with each other and pass the working comb from different sides each pass. the comb that started out empty will fill with the fiber leaving the guard hairs and shorter fiber on the comb that started full. 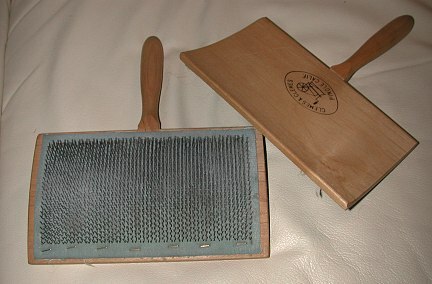 When the working comb is full of the fiber, remove the waste guard hairs from the first comb and trade comb positions. The first comb you charged is now the working comb. It takes 4 transfers to de-hair Pygora. After 4 passes, your fiber is ready to be removed from the combs and put into a roving. This is done by pulling it through a diz or hold of a button. Gently pull some fiber to a point and put it through the hole as if you were threading a needle. Now gently pull lengths of fiber through and you have a beautiful Pygora roving ready to spin! To prepare plucked fiber with hand cards, charge the combs the same as for the mini combs. Again, you will be passing fiber from one card to the other by gently pulling the empty card across the full one. when most of the fiber is on the empty card, switch hand positions and repeat. Before removing the rolag, you must decide if you plan to spin woolen or worsted. If you roll the fiber off by going front to back, you are preparing the fiber for woolen spinning. by rolling your fiber off the cards from side to side, you are preparing it for worsted spinning. There are many different ways to prepare Pygora for spinning. Which method is best depends a lot on which fiber type you are starting with. This type of fiber is always shorn. As stated earlier, a true type "A" should not have any guard hairs. If there are guard hairs, most times they are very short and easily removed by brushing the cut end with a comb or hand carder. This fiber may be spun directly from the locks with no preparations. For a great textured yarn, leave the soft tips of the locks sticking out. Type "A" makes fantastic, shiny, worsted yarn. Drum carding also works well with type "A". For worsted spinning, make sure the tips of the locks are facing away from you and the cut ends toward you as you feed them in. Double-tine mini-combs are the best way I have found to prepare type "A". You can create a worsted yarn, or by using the "point of draw' method, you can create a semi-worsted yarn. This fiber is shorter, less lustrous, and has more guard hairs than type "A". It also creates a softer, warmer yarn. If you have a goat that will pluck, by all means, pluck the goat. There will be less guard hairs to deal with. All methods described above will work with type "B". The use of mini-combs removes most of the guard hairs. Type "B" lends itself to woolen spinning. Plucking is the best way to harvest this fiber, combing is next best. If it is shorn, de-hairing is a must. 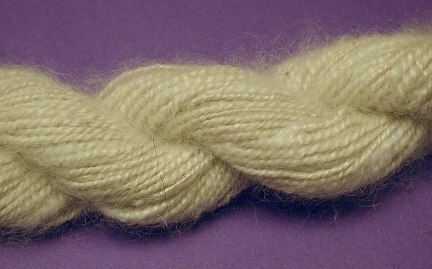 This fiber may be spun woolen or worsted; thick or thin. Gentle treatment is a must to keep from breaking the fiber. When using mini-combs, you will get all the guard hairs, noils, and short fibers out. The yield is very low, about 30% to 40% of what you started with, but what is left is fantastic!!! Pygora is a dream to spin once you get the hang of it. It is a slippery fiber, so care should be taken to put enough twist in it to hold it together, but not so much twist that your yarn comes out looking and feeling like rope. Here is where keeping a smooth rhythm and counting twisted really pays off. Most of the time, each fleece and fiber will tell you how it wants to be spun. The diameter of the fiber and scale proportion are what causes this. More scales means more fiber will want to grab in each draft, less scales mean fewer will catch and a thinner yarn will be produces. Relax and experiment with some fiber before you begin your project. Check the ratio of your wheel to help figure how much twist is going into each draft. Experiment and feel the fiber and see how it drafts and what the singles look like. If it needs more twist, shorten your drafting zone or drop down a whorl size on your wheel. If you want less twist, make the drafting zone larger or bring your whorl up one size. Remember, type "A" should be spun thin. Type "B" can be spun a bit thicker as it is lighter than "A". some "B" 's spin a bit thicker all on their own. Type "C" should not be spun too thick as the yarn is extremely warm. It will take some time and patience, but your experiments will help you learn how each fiber will spin for you. Use different drafting zones, different counts, different whorls and different fleeces. Always keep records on each trial so you can go back and reproduce the yarn you want and not make mistakes over and over. Working with short fibers requires a little more planning. 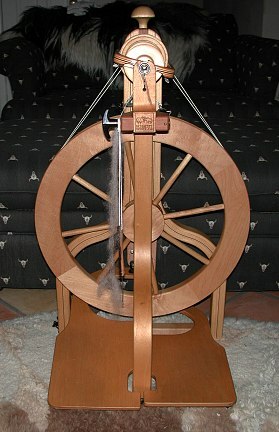 The easiest way to spin short fibers, for most people, is to spin a woolen yarn. You can make a great worsted yarn, however, it takes much longer because your drafting zone is very short. A normal drafting zone is about half the length of the fiber, so pull out a piece of what you want to spin and figure how long half is. Combing the fiber will stretch the drafting zone a little. While combing is very time consuming, that extra bit of drafting zone is worth it. Drum carding is another good way to prepare short fibers, but remember, it does not take out all the lumps and bumps. Fiber that has been through the drum carder can be spun either worsted or woolen depending on how it was drafted. To spin woolen, let the twist run right into the fiber in your drafting hand. In worsted, you pull out a few fibers with your front hand then pinch your back hand. This will keep the twist between your front hand and the wheel and prevent any twist from getting into the fiber in your back hand. Hand cards are also used to prepare short fibers. The way you roll the fiber off the cards depends on your choice of woolen or worsted spinning. Planning your project and the way you want to spin your fiber is very important. If you suit your fiber to your yarn and project before you start, you will have much better results. There is nothing worse than doing all that work to find out after you have finished spinning that the yarn you made will not work for what you wanted to make. If this happens, don't throw it away. There is a use for every yarn, just give it a chance! Soak your Pygora skein in hot water for a couple of minutes, squeeze the water out, then soak it in cold Ice water for a couple of minutes, then squeeze the water out. Do this about 2 more times. Once this is done, take the skein outside and smack it on a clean surface several times for a couple of minutes or until the yarn starts to fluff up giving it the "halo" effect. Let it dry then re-skein. If it's not fluffy enough, repeat the process until you will have a soft, fluffy, skein of Pygora yarn.